Later today - from 5 PM to 6 PM Central Standard Time - I'll be conducting the Public Half Hour Hegel Q&A Hangout for the month of March. 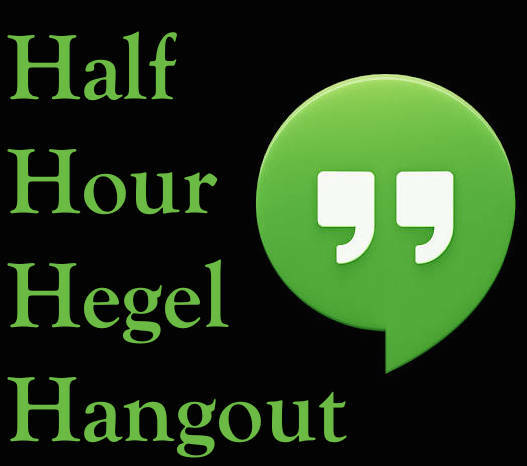 This is a free service I offer to the general public as part of the Half Hour Hegel Project, underwritten by my Patreon crowdfunding backers. Anyone is welcome to participate -- that's the whole point of having a public Q&A session, and I'll be giving priority to those who have actual questions to ask me. Google at present only allows 10 people at a time to be fully present in the Hangout (i.e. through their own video), but anyone can watch and use the text box to ask questions or make comments.